GROUP 5 ARCH IN FIBERGLASS, set of 4 - This arch kit sticks out 3" and is used when body line is cut away or retained. Originally as a group 5 arch it was made for cars with no modifications but has become a cheap jack of all trades especially when large odd size wheels are used. 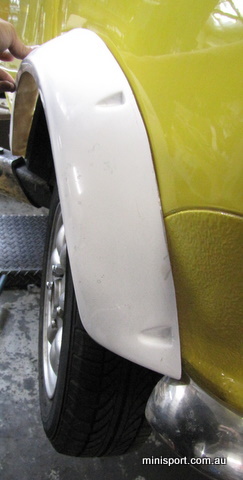 Rear arches stop at bumper seam line. Widest part at front approximately 5.5". Fiberglass is finished in white and is held on by screws recessed into the flare.